Precision Mini / Maxi Trunking & Fittings are manufactured from High Impact unplasticised polyvinyl chloride (UPVC) grade material capable of withstanding the most hazardous conditions on-site & exceeds the most stringent requirements of Indian and International standards. The product range brings a whole new world of sophistication and convenience to home, office & commercial establishments and is in accordance with Indian Standards IS:14927 Part 2 and BS: EN 50085-2-1. Mini Trunking are also available with self fixing tape for instant and easy installation. 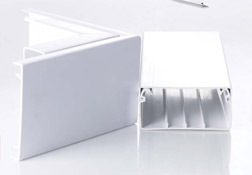 Clip on lid provides security while allowing easy maintenance. Precision Maxi Trunking Cable Management System is designed for convenience and safety with compartments for separate wiring applications. Maxi Trunking fittings are available in moulded and fabricated form, thus adding a sleek touch to your interiors. To organize & protect cables on surface. • Fast installation & easy maintenance • Secure & elegant look • Wide range of sizes to suit all cabling requirements • Durable & impact resistant • Fire retardant • Corrosion free • Thermal resistant from -5°C to +60°C. Black, White & Grey. Other colours available on a made-to-order basis.